This is the eastern-most Leptocoris species in the Pacific. It has a uniquely colored metallic green membrane. Leptocoris cf insularis adult from Cook Islands. Photo by G. McCormack. Physical description: Large in size, purplish-brown with metallic green membrane. Pronotum similar in shape to that of L. augur. 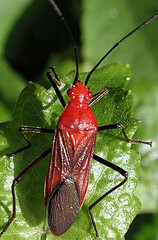 Ventral side reddish brown; last ventral segment irregularly marked with red, black, and orange. Appendages are black and coxae are red. Leptocoris insularis has been found in Fiji and Samoa but the exact locations of where it was collected are not known. Kirkaldy, G.W. (1908): A catalogue of the Hemiptera of Fiji. Proceedings of the Linnean Society of South Wales 33, 345-391.